Doctors and other health care professionals play an important role in the safe mobility of their older patients. The American Medical Association encourages physicians to make driver safety a routine part of their medical services. The American Geriatrics Society and NHTSA have published the Clinician's Guide to Assessing and Counseling Older Drivers to help healthcare professionals prevent motor vehicle crashes and injury to older adults. The Guide assists clinicians in assessing older drivers at risk for crashes and counseling older drivers to help enhance their driving safety. Resources for easing the transition to driving retirement when necessary are also available. Click here for our new page dedicated to this important resource or click the button above. Driver rehabilitation specialists, many of whom are also occupational therapists, have specialized training in identification of a driver’s strengths and the physical, visual and cognitive challenges presented by the task of operating a motor vehicle. They can evaluate an individual’s ability to safely operate a vehicle and make recommendations about ways to limit risks. Many of them are located in a healthcare setting in your community. There are vehicle modification items that require an assessment by an occupational therapist or driver rehabilitation specialist. This is to ensure proper installation and training on safe use. Examples of this include pedal extenders, panoramic mirrors, hand controls, seat lifts, steering devices, etc. Visit the AOTA website to find a Driver Rehabilitation Specialist. The Association for Driver Rehabilitation Specialists was established in 1977 to support professionals working in the field of driver education/driver training and transportation equipment modifications for persons with disabilities through education and information dissemination. "As we age, we often lose some of the abilities that make us safe drivers. Vision, memory, physical strength and reaction time may decline. That's where a little-known health-care professional can help out: a driver rehabilitation specialist. That's a therapist, often an occupational therapist, with special training to help people compensate for a disability that makes it hard to drive." Read the NPR article or listen to the audio entitled On the Road Again: Specialists Helping Aging Drivers. The following organizations offer resources for specializations in driver rehabilitation and mobility. The Safe Mobility for Life Coalition's mission is to improve the safety, access, and mobility of Florida's aging road user. Florida's Aging Road User Strategic Safety Plan, developed by the Coalition sets goals for improving safety and to help meet those goals, the Coalition needed to assess the current situation and level of knowledge among the health care community and other adult service organizations. The FDOT contracted with researchers from SRA Research Group Inc. to develop an assessment tool and conduct a statewide survey. The research project titled "Health Care Providers and Older Adult Service Organizations to Assist in the Prevention and Early Recognition of Florida's At-Risk Drivers" helped determine baseline levels of community practice, knowledge, interest, and resource needs regarding at-risk drivers. 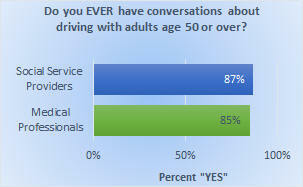 A majority of both medical professionals (85%) and social service providers (87%) said they discuss driving with adults age 50 and over. The majority (88%) feel a simple screening tool to help identify and better predict at-risk drivers would be helpful. The majority (88%) agree identifying at-risk drivers is everyone's responsibility. The Safe Mobility for Life Coalition will use the results of this research project to guide the development and/or dissemination of educational and outreach materials which support the recognition and reporting of at-risk drivers. For more information, view the project's final report and summary. Each state has its own licensing and license renewal criteria for drivers of private motor vehicles. In addition, certain states require physicians to report unsafe drivers or drivers with specific medical conditions to the driver licensing agency. Information on Florida’s Medical Advisory Board can be found on our Laws page. TransAnalytics Health & Safety Services sponsored website DrivingHealth.com includes information on medical fitness to drive, medications that might impair driving, screening and assessment, and training/remediation. 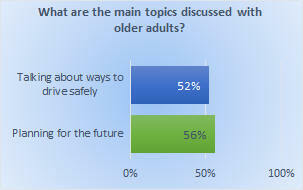 NHTSA https://www.nhtsa.gov/road-safety/older-drivers Resources for People Around Older Drivers.